Hemostasis – The Sequence of Events That Occurs During Hemostasis. Physiology ▶ Cardiovascular System ▶ Hemostasis – The Sequence of Events That Occurs During Hemostasis. Whenever blood vessels are damaged, the loss of blood poses a considerable threat to homeostasis. Hemostasis is a positive-feedback mechanism initiated after vascular injury to stop or limit blood loss. There are three separate but interrelated processes involved in hemostasis: vascular spasm, platelet plug formation, and coagulation. Notice that homeostasis and hemostasis are different words. A vascular spasm, or constriction, of the blood vessel results from contraction of smooth muscle within the vessel wall at the damaged site. Physical damage to the vessel causes the release of chemicals that initiate the spasm. Narrowing of the blood vessel restricts blood loss from the damaged vessel and it lasts for several minutes, which allows time for formation of the platelet plug and clotting. As platelets accumulate at the site of the damage, they secrete serotonin, a chemical that continues the contraction of the smooth muscles in the damaged vessel. Platelets normally do not stick to each other or to the wall of the blood vessel because the vessel wall contains several substances that repel platelets. However, when a vessel is damaged, the collagen in areolar connective tissue is exposed. Platelets are attracted to the site and adhere to the negatively charged collagen and to each other so that a cluster of platelets accumulates to plug the break. This process is enhanced by the chemicals released from both the damaged blood vessel wall and platelets aggregated at the damaged site. The formation of a platelet plug may not seal off the damaged blood vessel but it sets the stage for coagulation. Coagulation, or blood clotting, is the most effective process of hemostasis. The formation of a blood clot is a complex series of chemical reactions involving many substances. Blood contains both procoagulants, substances that promote clotting, and anticoagulants, substances that inhibit clotting. Normally, the anticoagulants predominate and blood does not clot. However, when a vessel is injured, the increase in procoagulant activity starts the clotting process. 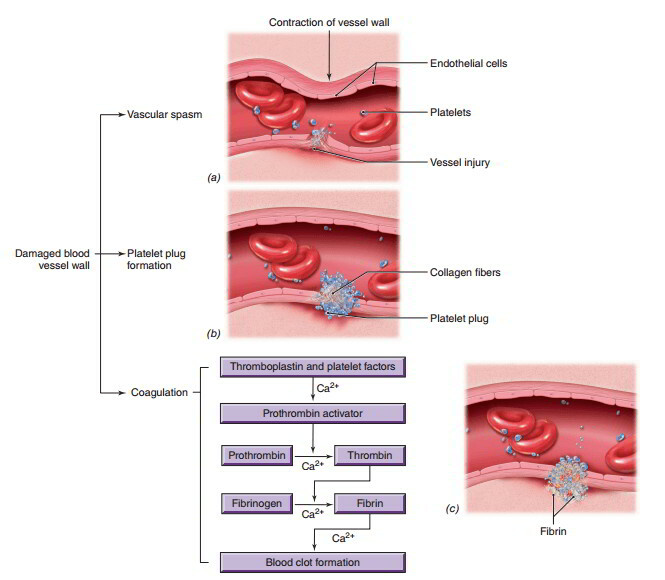 Damaged tissues release thromboplastin and aggregated platelets release platelet factors, which react with several clotting factors in the plasma to produce prothrombin activator. In the presence of calcium ions, prothrombin activator stimulates the conversion of prothrombin, an inactive enzyme, into the active enzyme thrombin. In the presence of calcium ions, thrombin converts molecules of fibrinogen, a soluble plasma protein, into threadlike, interconnected strands of insoluble fibrin. Fibrin strands crosslink to form a meshwork that entraps blood cells and platelets and sticks to the damaged tissue to form a thrombus, a blood clot. After a clot has formed, the platelets pull on the fibrin strands to bring the damaged edges closer together, which is important for vessel healing and the formation of a more compact clot that is harder to dislodge. Simultaneously, fibroblasts migrate into the clot and form dense irregular connective tissue that repairs the damaged area. As healing occurs, tissue plasminogen (plaz-min’-o-jen) activator (tPA), released by the tissues of the damaged blood vessel, converts plasminogen, an inactive enzyme in blood plasma, into plasmin, its active form. Plasmin breaks down fibrin and dissolves the blood clot.